"It's 10001 A.P. (Anno Porci). The known universe is governed by the Emperor Snorker, my father, who resides in Sty Central, the birthplace of porcinity. At that time, the most precious substance in the universe is our acorn beer: Slop. Slop increases longevity. Slop expands the realm of consciousness. Slop helps control the Force of Oink. But the coveted acorn now only grows in a single galaxy at the edge of the universe: The Fabled Alpha Cemporky. Whosoever finds and controls Alpha Cemporky rules over the known universe." Each player controls one of the six rival clans: The Porcus, Wartushoggus, Razorbacques, Boarbarossas, Javelinas and Porkeroos. The clans are at odds politically and militarily for control of the planets, especially where the acorn is grown. You had better know how to negotiate and fight (and vice versa). Your cunning and strength will help you be elected King Swine, Temporary Governor of Alpha Cemporky. At the head of your clan you lead your swine and dreaded Oinks, equipping them with the weirdest weaponry against your rivals. But you must also face the terrible extra-swine races that roam the galaxy. A simple, energetic game combining strategy, backstabbing and political finesse. 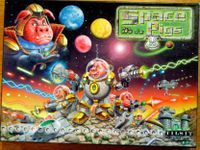 Space Pigs: A healthy and nutritious game. Warning: Excessive consumption of Slop is hazardous too your health, and will lead to endless frenetic game-play.